So a few weeks ago, as I crawled into bed after a long dusty and bumpy drive, I lay in bed looking up at the ceiling through the white gauze of the mosquito net. 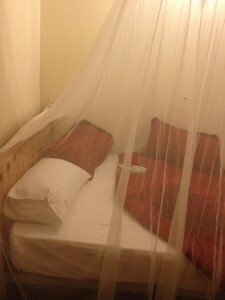 This particular net had been embellished with lace details and was draped nicely over the bed. It reminded me that as a child I always dreamed of sleeping in such a bed, shrouded with mystery and romance. I remember watching films that took place in far away places like Kenya and Zaire (now the Democratic Republic of the Congo), where the main characters, European or American transplants would fall asleep or wake up in these beds. It occurred to me on this occasion that, as a child, I had no idea the nets were meant for protection and not for some decorators romance. The nets actually protected the characters, and real life people from deadly Malaria. Having spent some time with the staff at the Bwindi Community Hospital I learned that Malaria still kills many children in Uganda. According to the World Health Organization (WHO), while infection rates have dropped nearly 33% in Africa, a child still dies every minute from Malaria(approximately 660,000 deaths a year, mostly among children). Many reasons they catch it is because the distribution of nets, sometimes for cost, has not been sustainable and has not reached everyone. Then we also hear of people who prefer to sleep outside, since it can be too hot (as it is in Gulu). The nets that may hang in the house don’t make the migration outside with the family or are sometimes torn or improperly used. Even with all the precautions people still die and still catch malaria. Many expatriates, including a Peace Corps member I met yesterday, contract Malaria despite sleeping under a net and taking anti-Malarias. Fortunately, for us, when we do catch the disease our immune system is not already compromised by Dysentery, malnutrition, or any other number of worms, viruses, and disease that many people are already infected with in Africa(and globally). We are also able to afford the medications that are needed to then fight the infection. Please consider donating to an organization like Imagine No Malaria, they are doing great work to help educate the population and distribute nets. There are also some very funny and educational movies about Malaria on Youtube. I found one the other day that featured the 7 dwarves, in a movie made by Disney in 1943, called the Winged Scourge. While some of the tactics are incredibly centered on the “new” chemical weapons, it still is very educational.